Legends at Santa Rita Springs is a 55+ community in Green Valley, Arizona. It is an ideal community for active adults who want a quiet oasis in a private setting near the heart of Green Valley Recreation s amenities and social activities. Legends at Santa Rita Springs is a quaint community in a convenient location. 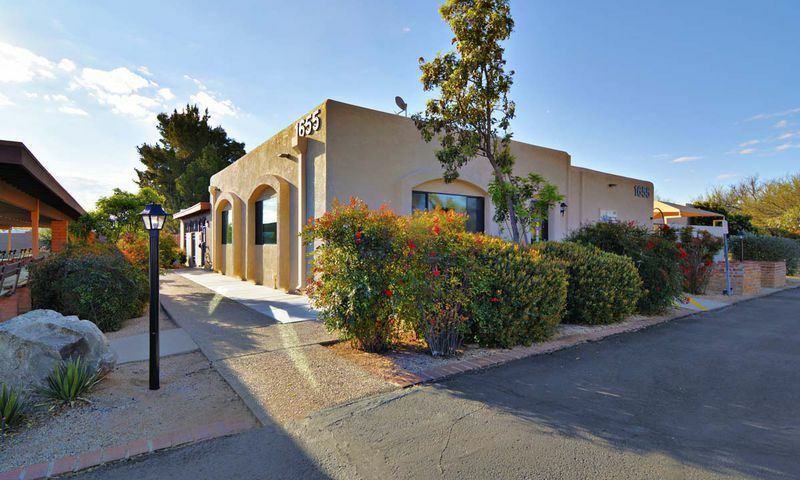 It is situated just south of Tucson and with scenic views of the Santa Rita Mountains. Homeowners enjoy own a low-maintenance home inside the gates of Legends at Santa Rita Springs. Residents of Legends at Santa Rita Springs have access to their very own outdoor pool and spa within the gates of the community. Here, residents often host potlucks and community parties on the poolside patio that s equipped with a gas grill. As a part of Green Valley Recreation, residents of Legends at Santa Rita Springs can access any of the amenities offered throughout the valley. Green Valley Recreation offers 13 recreation centers, 13 pools, and many outdoor courts. With a total of 24 meeting rooms, five fitness centers, numerous hobby studios, ballrooms, and more facilities there are countless opportunities to stay active throughout the year. There are even fishing lakes, walking and biking trails, and plenty of parks spread throughout Green Valley s recreation areas. Dorn Homes built 218 single-family homes between 1999 and 2004. Legends at Santa Rita Springs offers homes that range in size from 1,200 to nearly 1,800 square feet in size. Homes within the community offer main-level living with two to three bedrooms, one to two bathrooms, and an attached garage. Homeowners pay an annual homeowners association fee that covers maintenance of the community pool and spa, landscaping of common areas, and trash removal. Residents also pay an annual fee to access all of the Green Valley Recreation facilities, programs, events, and classes. Owning a low-maintenance home inside of Legends at Santa Rita Springs allows residents to live a carefree lifestyle. They have more time attend the monthly potlucks by the pool, join the Legendary Walkers group, or a water aerobics class. Green Valley Recreation (GVR) has an envious line-up of amenities that provides more than 60 clubs and groups that meet throughout the year. GVR s clubs and activities are offered in categories that include arts and crafts, cards and games, dance, sports, special interests, and social. With so many opportunities to find a club or activity of your favorite hobby, it s easy to make lifelong friends with fellow active adults who share the same interests. Legends at Santa Rita Springs is located in Green Valley, Arizona. This active adult neighborhood is tucked between East Frontage Road and Abrego Road on the east side of I-19. Green Valley is a conglomerate of 55+ active adult communities situated 20 miles south of Tucson. Active adults can enjoy the best of Southern Arizona s mild climate with so many things to see around Green Valley. Popular indoor and outdoor attractions nearby include the Arizona-Sonora Desert Museum, Catalina State Park, Madera Canyon, The Tucson Museum of Art, and Flandrau Planetarium. With Tucson International Airport about 30 minutes away, Legends at Santa Rita Springs in Green Valley makes traveling farther from home a breeze. There are plenty of activities available in Legends at Santa Rita Springs. Here is a sample of some of the clubs, activities and classes offered here. Dorn Homes built 218 single-family homes between 1999 and 2004. Legends at Santa Rita Springs offers homes that range in size from 1,200 to nearly 1,800 square feet in size. Homes within the community offer main-level living with two to three bedrooms, one to two bathrooms, and an attached garage. Please Note: Floor plans are not available at this time. Where else can you get 13 rec centers for under $50 a month? Really, yes, the monthly HOA fees are amazing. For me I didn't want to come home daily to a big huge community but I did want all the amenities like swimming pools, fitness centers, golf courses, restaurants, trails. It's the best of both worlds to have privacy plus all the amenities. I am also very active in a travel club and have been to many exciting places. I'm having lots of experiences I may not have had without making the move here. Any Green Valley Rec community you choose would be wonderful but for me this location was ideal. 55places.com is not affiliated with the developer(s) or homeowners association of Legends at Santa Rita Springs. The information you submit is distributed to a 55places.com Partner Agent, who is a licensed real estate agent. The information regarding Legends at Santa Rita Springs has not been verified or approved by the developer or homeowners association. Please verify all information prior to purchasing. 55places.com is not responsible for any errors regarding the information displayed on this website.